An original M14 birch "Big Red" wood stock. 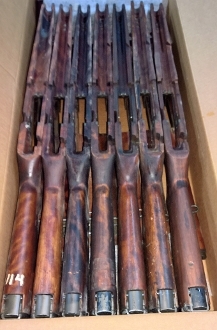 These are a late production modified design of the original M14 wood stock. The pistol grip/wrist area and receiver/mag cutout were thickened to increase durability. Many shooters appreciate the larger pistol grip for better control and the additional wood around the receiver cutout that makes bedding the receiver easier. As these were primarily issued as replacement stocks, they do not have proof marks. Very Good Plus (Fred's "Select Plus") - looks well used. Will have multiple dings and scratches, finish is OK to rough. May have a minor arsenal or manufacturer's repair. Metal is used (worn). No unrepaired cracks. Same as Very Good except that (in my opinion, as a stock refinisher) the dings and scratches are fixable with patience, steaming and light sanding. This is the price point that makes a prime refinishing stock. Straight (not fancy) grain. Comes wth a complete metal kit attached. The buttplate is in used (good) condition. There is an upgrade option available for an Excellent condition buttplate.